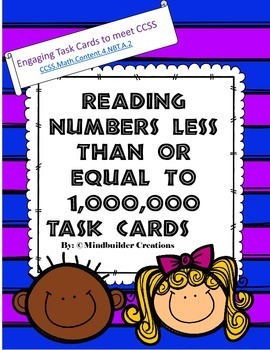 Reading Numbers to 1 Million Task Cards will give your students the extra practice they need to become masters at reading numbers. Why use task cards? They offer a great option for reinforcement and/or enrichment. 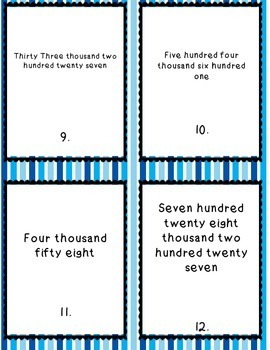 You can use them in small groups, as a math center, for partner work, for fast finishers and they save you time from making tons of photocopies! 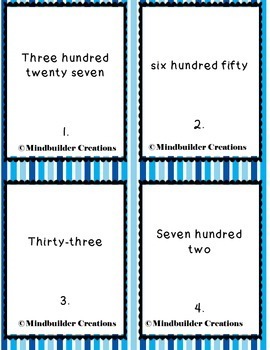 With this product you get 20 task cards and 4 blank ones for you to create your own. 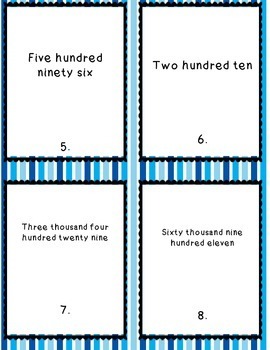 This product is copyrighted and is for classroom use only. As expected this product meets common core math standards! A helpful hint for my customers: TPT gives credits that can be used later for new purchases when you leave feedback. In addition, keep up to date on new freebies product launches by following me.